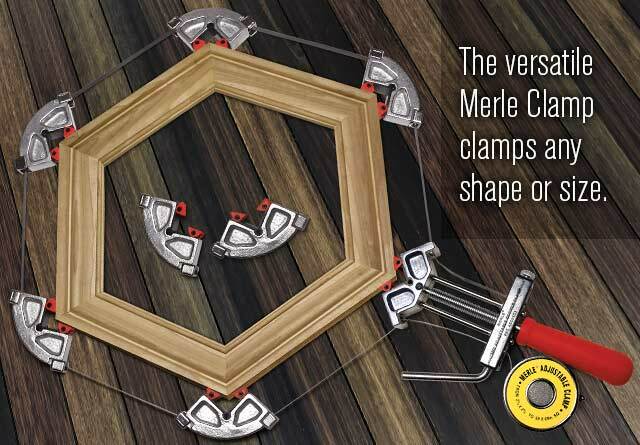 Merle Band Clamp features pivoting jaws and exclusive Quick Release Corners! The Merle Band Clamp feature quick release corners and pivoting, self-adjusting jaws that align to any angle, even circles! Ships with a 23 ft. STEEL banding reel (additional reels available). The Merle clamp has almost no capacity limitation! Quick Release Corner Clips pull off with finger pressure. Just clip on more corners and get to work! Pack of 10 self-adjusting jaw inserts. I bought the set of four with extra jaws. 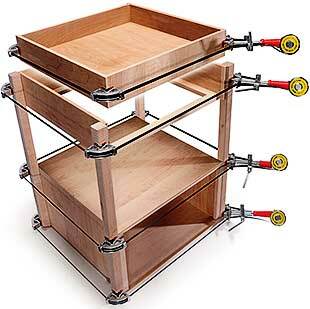 These are excellent clamps, but plan on an hour or two learning before you do a glue up. The jaws are one inch wide, and if your project is narrower, (my outside edge was 3/8th inch), you will need spacers under the project to raise it to the middle of the jaws. Otherwise, the band WILL tilt the pieces during glue up, resulting in a messed up project. The clamp worked extremely well for glueing a raised panel door with rubber space balls to keep the panel from rattling. The clamp forced the sides together with ease. Used these to edge 1/2" Baltic Birch with 1/2" x 1/2" Mahogany. Very impressed, clamped well with no slippage. Tell me something how are do you reel in the band without all that spring action other then that I think it's a good product. I owned 4 of these clamps for a long, long time. They are great to use, you will not be disappointed with them. When I first used this clamp I thought what a waste of money. It has a learning curve to it and after countless uses on portrait frames and display cases, I have to say this was one of the best purchases that I have ever made for my woodworking shop. It is incredible. I just finished a 52"x17" rifle display case with perfectly square corners. I have messed with many framing clamps, but none like this. Once you solve that minor learning curve, it's fantastic. This is the best band clamp I have ever used. It gives equal clamp pressure at all joints and squares your project at the same time. This will never happen with nylon strap clamps. It took a couple trial runs to get the hang of how it works, now it's a breeze. I will be buying more as the need arises. Excellent Clamp! Will buy more. Easy to use and achieves even pressure on all four corners as advertised. I used to hate making frames of any kind. It was never easy to get them clamped up to produce good, tight joints. When I needed to make a frame for an antique leaded glass window I decided to try the Merle Clamp. My original expectation was "just another band clamp" but I was surprised at the results this clamp produced. Great, tight joints. As long as your miters are true you'll always get a strong, square frame. I'm still not a fan of making frames, but with the Merle Clamp I get the results I'm looking for. Highly recommended. I have had this thing for a few months and it is excellent for what it was designed for; Clamping large, multi-sided projects. If you are looking for something to clamp small projects like clocks, picture frames or the like, keep shopping. This will just be an exercise in frustration and futility. For larger projects, from boxes up it works very well. The steel band seems a bit cumbersome at first, but once you get the hang of it is an advantage. Admittedly, there is a bit of a learning curve associated with dealing with the rigidity of the steel but with a little practice it becomes a real advantage. There is a bit of an issue at first with rolling the band up also as it doesn't like to slide along itself very well, at first. But some use and a few judicious applications of graphite alleviate this problem. Overall a reasonably good acquisition and I will probably get another to make a set. I have 18 and I love them. They square your product for you I need ten more but I will buy 3 four packs....much better deal. They are the BEST band clamps out there by far. Not worth a crap if your material is thinner. Bought it because of the video With mitered doors, but wasn't happy with it. Make three different picture and mirror frames. SAVE $32! 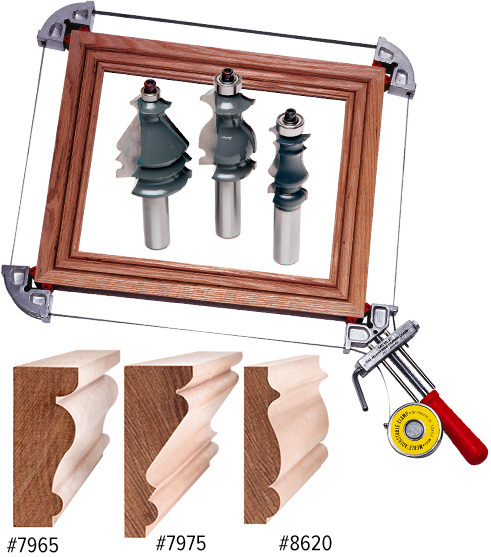 Includes three MLCS Picture Frame router bits #8620, #7965 and #7975 plus the Merle Band Clamp. All router bits are 1/2" shank, two flute, carbide tipped with totally enclosed ball bearing guides. List $127.90. SAVE $32! Includes three Picture Frame router bits, and a Merle Clamp. Hang straight pictures in 3 steps! Use Hang-O-Matic's built-in sliding anchors to measure the distance between two holes or hangers on the back of pictures, shelves or TV's. Use the built in level bubble to level Hang-O-Matic on the wall. With a firm press on both ends, Hang-O-Matic makes two perfect marks on the wall. Then, use any hardware, any size, to hang it perfectly level, every time. Pocket size unit measures, levels, and makes two accurate marks. Hang shelves, pictures or TV's using any hardware. Measures up to SIX feet. Clamp up to 24 total sides at once! SAVE $22.75! Clamp like a Pro! 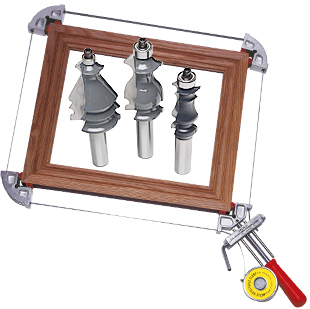 No more waiting for glue to dry when making new doors, drawers or picture frames - clamp 4 at a time! Large furniture and case work often requires 2-4 clamps. Clamp unique shaped and multi-sided projects at any angle, up to 24 total sides. 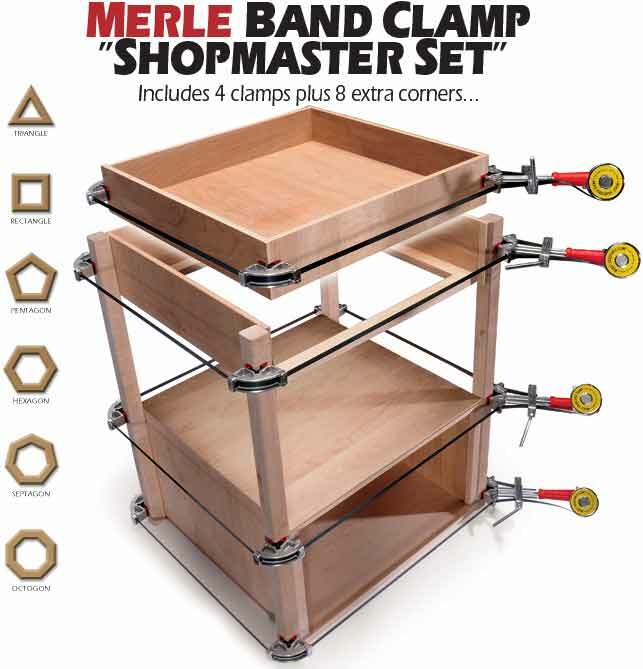 The Merle band clamp is one of the best of its kind on the market. The metal strap does not stretch under tension and ensures equal pressure at all contact points. It's only major deficiency is the locking lever which becomes an appendage that gets in the way and interferes with laying a frame out flat on a bench without raising the workpiece or positioning at the bench corner. Replacing this lever with a cam jaw locking mechanism would be a major improvement. I have a cabinet/furniture shop. These are the best band clamps I have ever used. Fast, easy and square up every time. My drawer boxes are dovetailed. I have 8 of these and I am ordering 4 more. I only wish they offered a longer band. Being a custom shop I could use longer than 21 foot at times.